Showing results for tags 'Itaily'. The lightbulb lighting a sign stating that the Itailian restaurant is open flickers through the polished window. Ponies sit at tables, laughing and talking as they eat breads, pastas, and soups. Even while standing outside, the very dim sound of chatter can be heard. Beyond the oak doors, the walls have a wallpaper with a leafy pattern on them-- a light green against an even lighter one. The floor is boarded with a dark wood that squeaks in a few places. Lamps hang from the ceiling, adding a cheery glow to the room, but candles are available for those who are feeling like romance. Jars of herbs recognizable as oregano, rosemary, and line the counter, behind which a few pots can be seen bubbling and steaming as chefs tend to them. A green unicorn who appears to be between the ages of filly and mare pulls a golden-brown foccacia out of an oven. She glances towards the door to see if any ponies are entering, but they aren't. There are many empty tables, and the scents of basil and tomato emanating from the restaurant smells enticing. Maybe it would be a good idea to go there sometime... OOC: If you would like to join, just have your character enter the restaurant. Well, two weeks of vector work, here is the result! 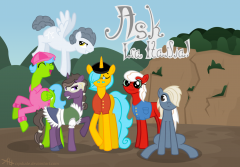 All six ponies in one ask blog, coming soon to a Tumblr near you! Background of my heavily redesigned alicorn OC, Emperor Mondo, just to experiment with colors. I think I've finally come to a combination I can be happy with! 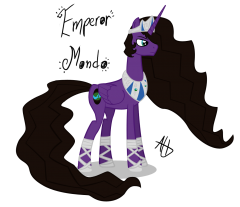 If anypony wants this resized for their desktop, send me a PM and I can to it! Oh hey, I know that stallion. Did I just make an Alicorn OC? Yes I did. Angry yet? No? Good. 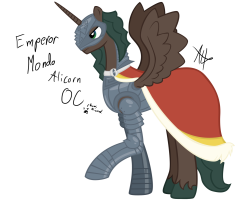 Though this is strictly fanon because of wings and horn at the same time, Emperor Lapiste Terramondo (Emperor Mondo if that's easier to remember,) is the current ruler of the land of Itaily, and is also Celestia and Luna's uncle on their father's side. His special talent is turning the world to bring about the natural seasons, setting the stage for proper snow to fall, plants to change in autumn, bear fruit in the spring and summer, etc. Earthly powers and such. Enjoy, and tell me what you think! © Character by Alec Harris. 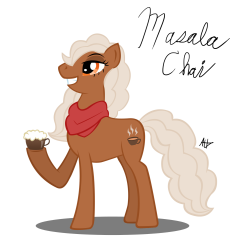 A redo of my favorite OC, Masala Chai! Hopefully, I can get a good application in for her soon!